The energy commodity group is the second very important group that is heavily tracked by short term traders and also by investors. 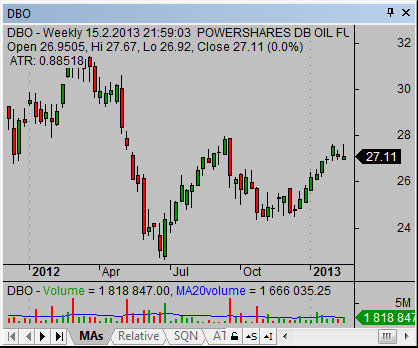 Energy etf shares tracking oil based indexes are the most popular and known. But other energy based funds tracking commodities like natural gas or alternative energy sources are offer also a good trading or investing opportunities. The oil is a commodity that plays an important role in today’s economy. There are already several options how to trade it. Active investors have several options when they want to select the best energy exchange traded fund for their portfolio. DBO, The PowerShares DB Oil Fund is based on the Deutsche Bank Liquid Commodity Index – Optimum Yield Oil Excess Return™ (Index) and managed by DB Commodity Services LLC. It is a rules-based index composed of futures contracts on light sweet crude (WTI). USO. The investment objective of USO energy fund is for changes in percentage terms of the units’ net asset value to reflect the changes in percentage terms of the spot price of West Texas Intermediate (WTI) light, sweet crude oil delivered to Cushing, Oklahoma (WTI light), less USOF’s expenses. USO is well known energy based fund. But it is not ideal for a medium-term or long-term positions. 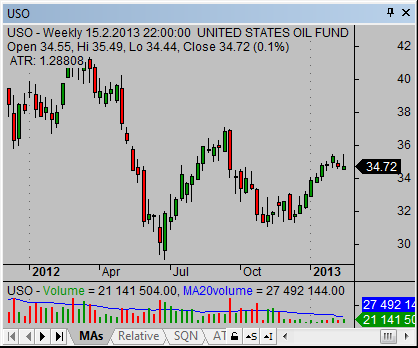 It has huge costs and it can be seen in its under-performance comparing to the price of spot WTI or its futures. The DBO or OLO exchange traded funds are much better choice for these strategies. USO can be well used for short-term strategies like swing trades with commodities or for daytrading the oil price movement.